Sherwood Conservative Association is responsible for campaigning in the local area and supporting Mark Spencer. It is made up of a number of groups and Branches. The structure and some key contacts can be found here. After working in Law, Emma has been working for the Conservative Party in the East Midlands Region for some 8 years, first as Press Officer for the East Midlands Conservative MEPs, then as Political Advisor in the European Parliament in Brussels where she gained first hand experience of the legislative process in action. Emma is now one of five elected MEPs for the East Midlands region. Since elected Emma has been appointed Conservative Spokesman and Coordinator on the Culture and Education and Sport Committee in the European Parliament, as well as being a member of the Internal Market and Consumer Protection Committee and International Development Committee. She was recently appointed Chief Whip. District Councillors - Ben Bradley, Mick Murphy (Hucknall North), Kevin Rostance, Phil, Rostance (Hucknall West), Chris Barnfather, Colin Powell, Bruce Andrews (Newstead Abbey), Tammy Bisset (Bestwood St Albans), Jane Walker, Boyd Elliott, Paul Stirland (Calverton), Helen Greensmith (The Dumbles), Frank Taylor (Farnsfield). 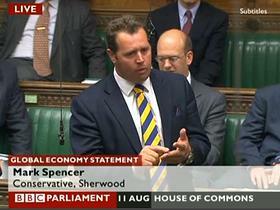 Mark is the Member of Parliament for Sherwood, having been a farmer and a businessman, employing 50 people. His family have lived in the constituency for four generations. He was born in 1970 and attended Lambley Primary School & Col Frank Seeley Schools Calverton, then trained at Shuttleworth Agricultural College Bedfordshire before joining the family farm business. His business interests include Spring Lane Farm Shop and Floralands Garden Village at Lambley. He is married to Claire and they have two children. Mark First fought Hucknall Nottinghamshire County Council seat in 2001. He went on to win a Ravenshead Gedling District Council seat in 2003 and won Calverton Nottinghamshire County Council in 2005. First elected in 2010, we are delighted to say that Mark retained his seat in 2015 with a hugely increased majority.